I can't believe my last post was written in December 2013. I'm such a sloppy blogger. However, this time again I'm back with a free pattern! I actually made this sweater a few years ago. This sweater is easy enough for a beginner to try, but at the same time it's stylish and versatile enough that any knitter would like to knit. I took notes as I was knitting to make a pattern someday, but my notes got lost in moving. A few months ago, I finally got around creating the pattern based on the sweater and my memory. 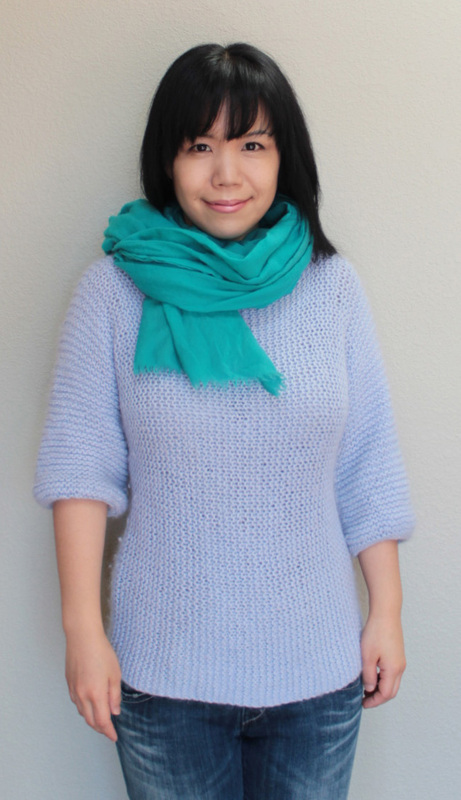 Since the pattern was written much later without the notes, I've been postponing the post until one of my friends test knit it for me, but all knitting friends have been too busy to test knit it and the weather is getting colder, so I decided to just post it. Please let me know if you find any error. On the pattern, I listed Jaeger Roma and Rowan Kid Silk Haze as the recommended yarns. 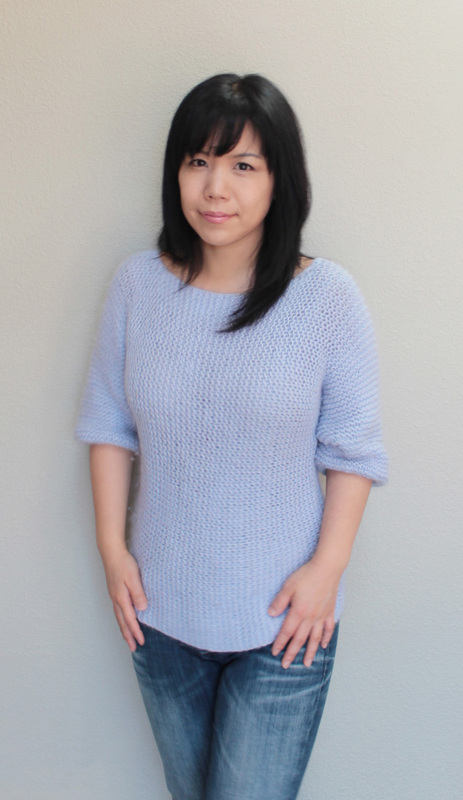 However, the sweater in the photo was actually made with 1 end of Jaeger Roma and 1 end of Knit Picks Aloft. The reason why I replaced Knit Picks Aloft with Rowan Kid Silk Haze is because I found Aloft shed like crazy - almost to a point that it was not wearable with other clothes. (Yes, when you need to wear this with some kind of bottoms.) I washed and ran it in the dryer with no heat cycle hoping to remove some of the loose fibers, and I ended up removing a huge ball of fibers as you can see in the picture below. That's why I didn't listed Aloft as the recommended yarn. I tried to estimate the number of balls of Kid Silk Haze as close as possible, but I couldn't calculate the yarn consumption for all sizes yet. Moreover, I found that Jaeger Roma has been discontinued. As for a substitute yarn, I would recommend using somewhat fluffy light worsted weight yarn. 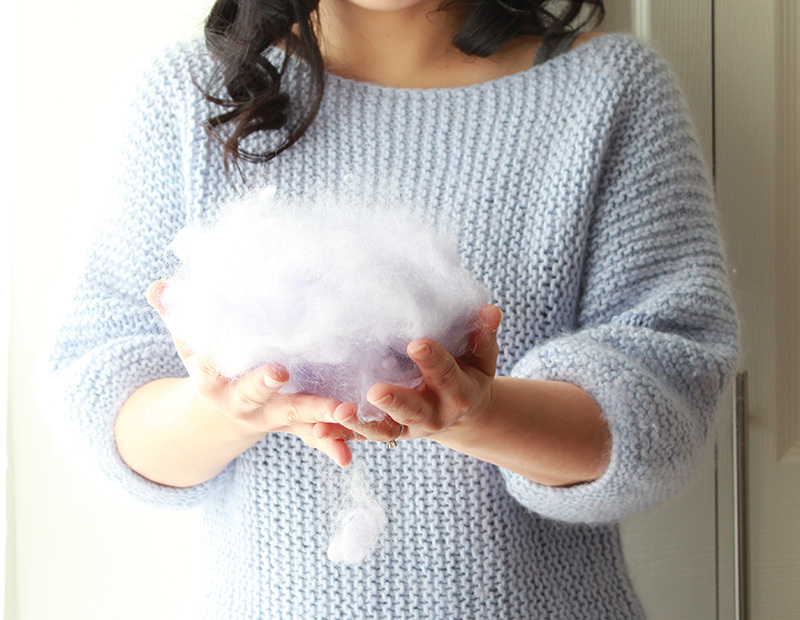 Though the label claims Roma is DK weight, I think it is thicker and fluffier than other usual DK weight yarns.